Amid worry about the impact hydropower dams are having on the economically and environmentally critical Mekong River, leaders of four Southeast Asian nations dependent on its waters are scheduled to convene a summit early next month to reaffirm their “political commitment” to a 1995 cooperative agreement. The Mekong River Commission (MRC), gathering in Cambodia’s Siem Reap province, will include a vote on adopting the next four-year plan for the riverine nations of Thailand, Laos, Cambodia and Vietnam. Representatives of China and Myanmar, both “upstream nations,” will attend as “dialog partners” without voting rights. 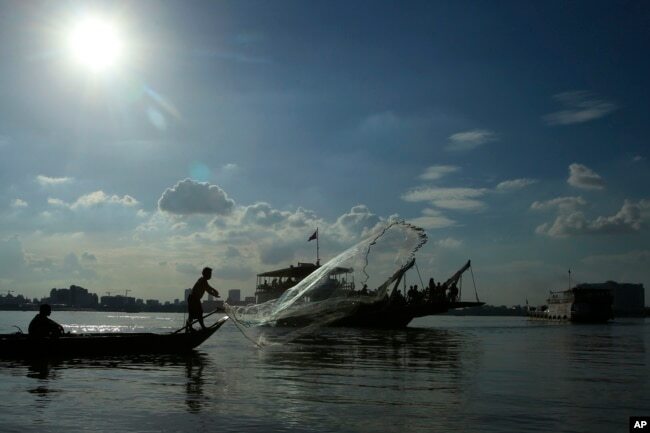 FILE – A fisherman casts his net next to a ferry in the Mekong River near Phnom Penh, Cambodia, Dec. 1, 2015. The livelihoods of 60 million people depend directly on the 2,700-mile-long Mekong River, which originates in China and empties into the South China Sea. Its fisheries alone were valued at $17 billion, or about 13 percent of the international trade value of fish as measured by the latest export forecasts of $130 billion for 2015. As a food source, the river “touches the lives of more than 300 million,” according to the World Wildlife Fund. Any measure to regulate the river’s flow, such as dams, has the potential to affect the member nation’s economies and millions of lives. “During the past two decades, the dams upstream have drastically altered the river’s natural flood-drought cycle and blocked the transport of sediment, affecting ecosystems and fisheries downstream,” she told VOA Khmer in an email. Convened every four years, the summit brings “together political leaders to address the prevailing challenges and opportunities facing the Mekong Basin,” according to an MRC release. The summit will focus on the theme “Joint Efforts and Partnerships to Achieve the Sustainable Development Goals in the Mekong River Basin.” The leaders’ summit on April 5 will follow a preparatory ministerial meeting on April 4 and a stakeholders conference on April 2-3. FILE – This image from video shows a dam on the Mekong River in Laos. Te Navuth, secretary-general of the Cambodia National Mekong Committee, said that the MRC summit is to reaffirm “political commitment” of the member nations to the 1995 Mekong Agreement. He added that they will review what has been done in the four years since the last summit and sort out what will be undertaken in the coming four years. 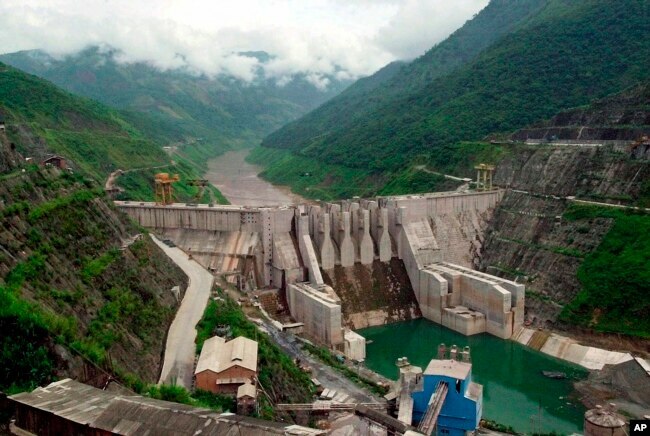 FILE – The Dachaoshan dam on the upper Mekong River is pictured in Dachaoshan, Yunnan province, China. Laos is determined to become the “battery of Southeast Asia” and is building two highly controversial dams, Don Sahong and Xayaburi, while preparing the site for a third, the $2.3 billion Pak Beng project. 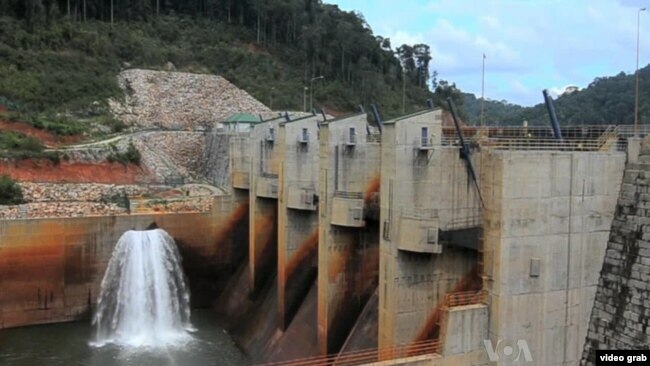 With more dams planned, it has rebuffed complaints from downstream nations.